Whether this is a positive or a negative, I don’t know, but it looks as if 343 Industries is not looking for the general public to beta test its upcoming content update for the Halo MCC. They say that this is because there were additional challenges discovered while developing the new update that required them to either rollback some features or create new features. This complicated the development more than they originally anticipated so they have thus cancelled the usual beta testing of this content update for Halo MCC. Some features had to be rolled back and even other features had to be created from the ground up, taking more developer time. 343 Industries is instead looking to release the content update to Halo MCC sooner than expected without the usual public beta test. This method should allow for an even smoother experience. However, because they tear down any previous fixes to provide for an overall better experience. The focus seems to be on further improving and even fixing the matchmaking experience that has been severely broken since launch. The Halo MCC content update currently doesn’t have a release date, but should make it to us sooner or later, hopefully with real fixes. They also have promised the development of a very classic and awesome map; Relic. 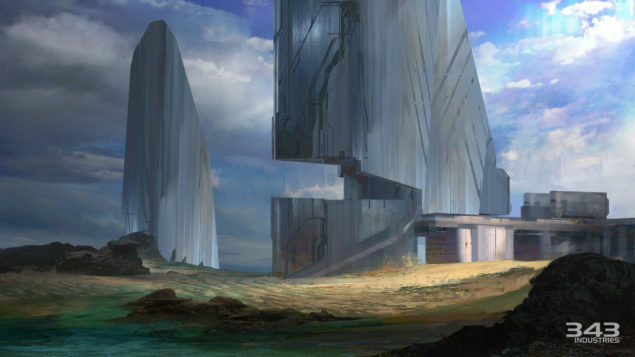 They want to bring this map into the Halo MCC because of its popularity and how it should augment the already great choice of maps for Halo 2 Anniversary. They’ve released some concept art of what they want the remastered version to look like as well. Is it truly wise, however, to abandon that public beta model they’ve been using? The issues they’ve faced may have passed muster in internal tests, but clearly provided issues, so feedback from the gamer public at large would be highly useful, I would think. But perhaps, aside from statistics they can gather, feedback from those playing hadn’t been quite as useful as they needed. Some play and complain, others play and say nothing. Issues aside, the Halo MCC has its merits and still provides a relatively enjoyable single player atmosphere that stands up to its roots. The multiplayer aspect, while definitely broken in its current state, can be challenging and fun for those that wish to divulge.